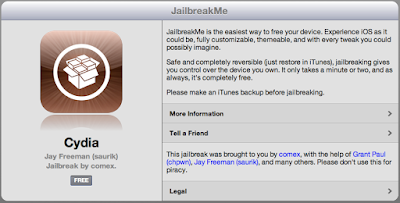 JailbreakMe is the easiest way to jailbreak certain compatible ios versions. It was developed by Nicholas Allegra a.k.a Comex. Using jailbreakme, a user just have to open a website from his/her iOS device using Safar browser i,e www.jailbreakme.com and then just slide of a finger does the magic. iPhone 2G, iPhone 3G, iPhone 3GS, iPhone 4, iPod Touch 1G, iPod Touch 2G, iPod Touch 3G, iPod Touch 4G, iPad 1 and iPad 2. iOS 3.1.2, 3.1.3, iOS 4.0, 4.0.1, 4.2.6, 4.2.8, 4.3.0, 4.3.1, 4.3.2, 4.3.3. 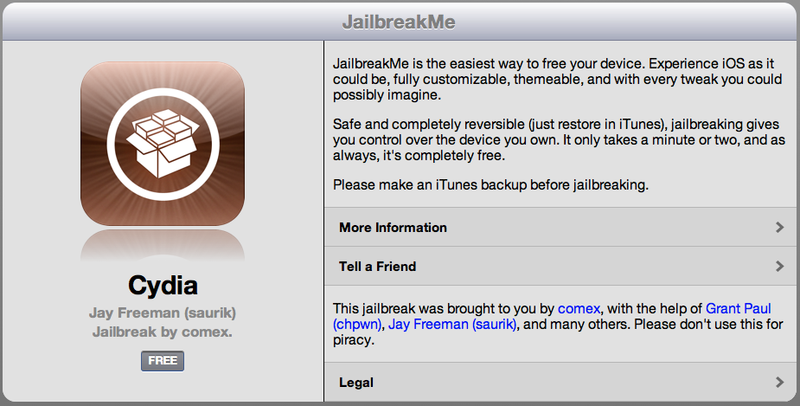 To jailbreak, simply visit jailbreakme.com from your device.